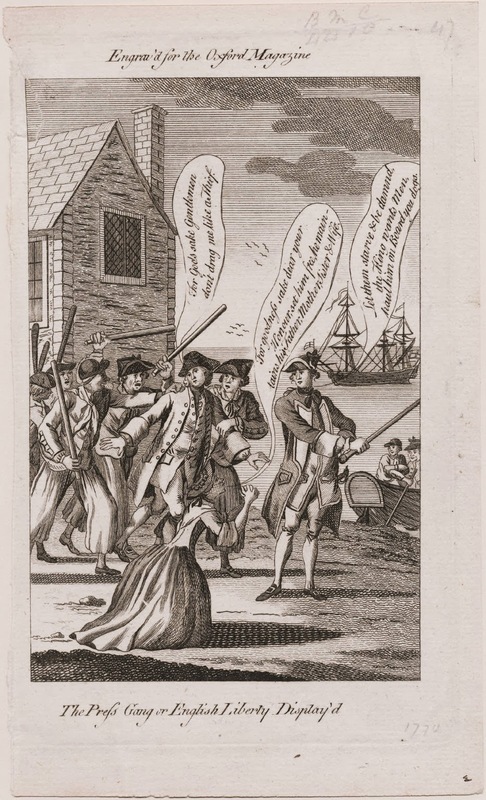 The Press Gang, or English Liberty Display'd, 1770, Walpole Library. Typical of depiction of press gangs, this unnamed cartoonist depicts a man being physically dragged away by a gang of unruly sailors bearing rattans and cudgels. A woman kneels at the feet of a British naval officer, begging him "For goodness sake dear your Honour, set him free, he maintains his Father, Mother, Sister & Wife." 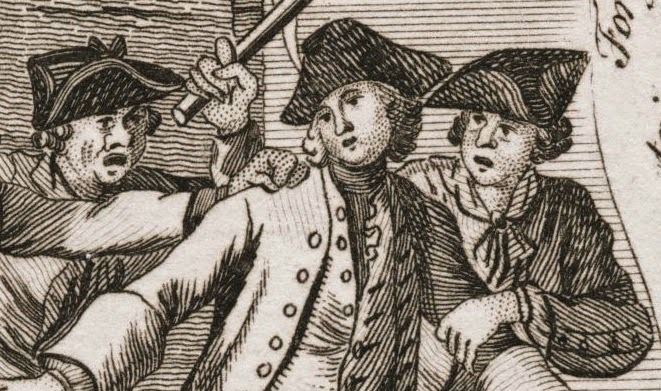 Despite her pleas, the brutish officer (who notably wears his cocked hat reversed like a common sailor) replies: "Let them starve & be damned, the King wants men, haul him on board you dogs." The dogs scowl at the man, waving their sticks and shoving him along. All of them wear jackets with slash cuffs buttoned down with flaps. The chap to the left of the unfortunate victim, who holds his shoulder in a fist, wears a single breasted waistcoat and a very loose pair of trousers. His hat is a jockey style cap with a very short brim to the front, and a band around the crown. Beside him is a sailor in much the same outfit, though with a cocked hat trimmed in tape and with a cockade, worn reversed. Behind the man being pressed is yet another sailor with a backward cocked hat, this one untrimmed and without a cockade. Instead of the trousers his mates are wearing, he has a pair of slops. 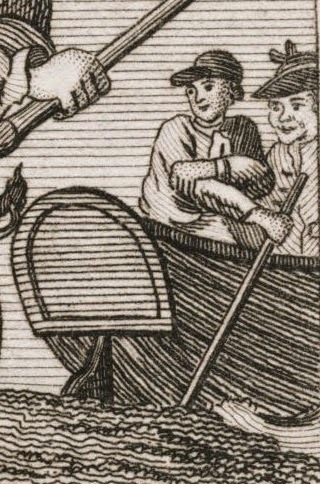 In the boat to the far right is another tar with a jockey style cap, and his mate in a reversed cocked hat bound in tape and fitted with a cockade. All of the sailors wear light but solid color neckcloths.